WOW... I had a wonderful time. As a relatively new diver, Paul took such great care of me and it was just a thrill to have had this experience. I will be back next year and many years to come. I enjoyed diving with Aquatic Sports. The Swordfish may not be the fastest boat on Cozumel but it is certainly comfortable. Good dives (1) Palancar Horseshoe (43 minutes and 73 feet) followed by (2) San Francisco (53 minutes and 61 feet). The water was a constant 79 degrees. Sergio and his staff provide the BEST lunch of any 2-tank boat dive I've ever been on (approx 250 dives). GREAT DAY. 2010 is year 4 for us diving in Cozumel. Sergio has provided top notch service every day on every dive. His equipment is newer and cleaner that any other dive operation if have been with. His knowledge and safety record in unmatched. On top of all of the above, he is a Diving Legend. We really recommend Aquatic sports. Sergio is very accomodating for requests and he is friendly making you feel comfortable. They provided us delicious lunch and drinks. Boat is large enough to enjoy sailing to the dive spot. We stayed about 5miles from the pier but he picked us up every morning which saved us a lots of taxi fee. Definitely we'll return to Aquatic sports for the next Cozumel trip. Thanks Sergio and congratulation on your marriage!! dopo aver respirato questo posto, non si può dimenticarlo, resta nel cuore! Belle le immersioni e cordiale lo staff! Sergio, My compliments on another sensational dive week. Yourself and your staff, Cheesepah and Eric, were more than generous with their time and doing all of the work so that I could simply jump in and enjoy. 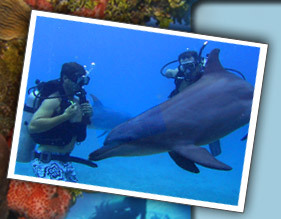 I look forward to my next trip to Cozumel and diving with you again. My family and friends took a private late afternoon snorkel and sunset watching excursion on July 8,'09. We had an absolutely wonderful time and highly recommend this experience with Aquatic. First, and importantly, the boat, "The Swordfish" is large and roomy with a bathroom and overhead protection from the sun. It also has an upper deck to enjoy the views; with room for several to sit with the captain or lay in the sun. The crew Eric and Jose were professional,friendly and helpful. We snorkeled for over an hour along the Columbia shallows reef and then dropped anchor in the shallow water further south where the kids played in the water and found dozens of star fish. We enjoyed some terrific snacks and drinks and watched an incredible sunset. Paul was a wonderful guide and host....thanks very much! My wife and I live in Cozumel. I had the pleasure of diving with Sergio on the Swordfish, and have also had the opportunity to go out on the boat on a non-diving, relaxing excursion with friends. The quality of the crew and the service provided is as good as it gets. continue to dive and enjoy non-diving boat trips with you again and again. Mi esposa y yo somos de la ciudad de mexico y tuvimos uno de los mejores viajes en sunset desde la embarcacion y todo el servicio que dan fue excelente, sergio es muy amable y siempre ve lo que realmente quiere el cliente!!! !